Today, as part of their 10 Days of Deals promo , REI is taking an extra 30% OFF kids' gear, clothing, and footwear. This is on top of already discounted prices. Dress that child up in the latest fashions with a price that can't be beat. Everything from backpacks to roller blades to jackets to pants are included. 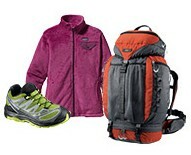 Sample brands include North Face, Columbia, and Patagonia. Note: The 30% OFF will be added (actually subtracted) at checkout. So the price you see is the sale price before the discount.